The results of the analysis of soil chemical parameters, texture, and color are reported for 185 georeferenced soil profile sample points over four forested headwater catchments near Juruena, Mato Grosso, Brazil (Novaes Filho et al., 2007a and Novaes Filho et al., 2007b). Samples were collected from an approximately 20 x 20-m grid over each watershed from 2004/05/01 to 2004/08/18. By sampling each location at depths of 0-20 and 40-60 cm it was possible to distinguish and map the principle soil classes found in the study area to the 2nd category level of the Brazilian System of Soil Classification (Cooper et al., 2005) associated with the topographic relief. The data set contains one comma separated ASCII data file with spatially referenced soil nutrient and organic carbon data from 0-20 cm (A layer, topsoil) and 40-60 cm (B layer, subsoil) depths for the Juruena watersheds study area. A satisfactory relationship between the redness index of the diagnostic horizons and the soil class colors was also found. In spite of the apparent homogeneity of the visible landscape characteristics such as slope, soil color, and vegetation, the carbon and soil clay attributes were found to vary greatly. This variability over small distances demonstrates that extrapolation of soil characteristics and soil carbon stocks to larger areas could produce erroneous results if the spatial variability of the soil attributes is not taken into consideration. Figure 1. Soil sample locations (plotted by ORNL DAAC) are depicted with watershed delimitation and streams overlain on a 2002 IKONOS panchromatic image of the forested study location (courtesy of EOS-Webster). Watersheds are identified as B1, B2, B3, and B4 from right to left. Data users should use the Investigator contact information in this document to communicate with the data provider. Alternatively, the LBA Web Site[http://lba.inpa.gov.br/lba/] in Brazil have current contact information. The investigators were Novaes Filho Joao Paulo; Johnson, Mark Stephen; Couto, Eduardo Guimaraes and Lehmann, Johannes. You may contact Novaes Filho, Joao Paulo (jpnovaes@terra.com.br). 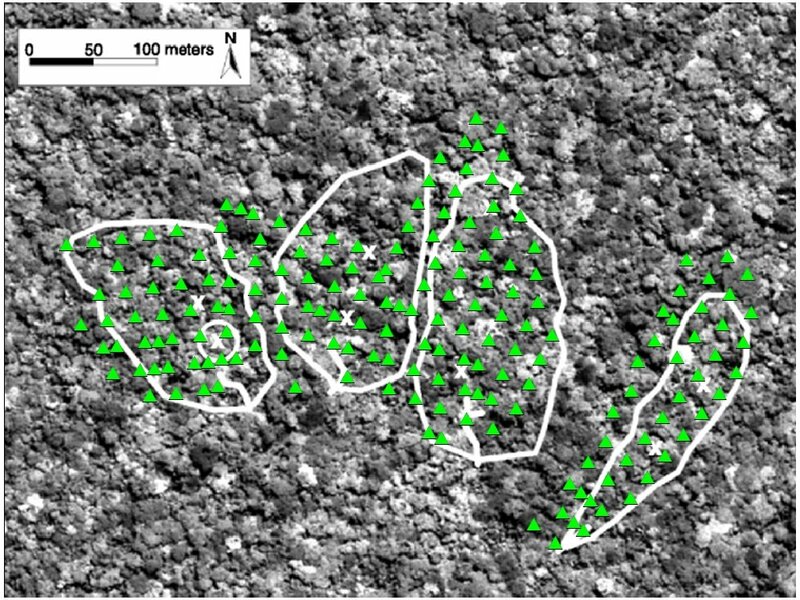 The results of the analysis of soil chemical parameters, texture, and color are reported for 185 georeferenced soil profile sample points over four forested headwater catchments near Juruena, Mato Grosso, Brazil (Novaes Filho, et al., 2007a and Novaes Filho, et al., 2007b). Samples were collected from an approximately 20 x 20-m grid over each watershed from 2004/05/01 to 2004/08/18. By sampling each location at depths of 0-20 and 40-60 cm it was possible to distinguish and map the principle soil classes found in the study area to the 2nd category level of the Brazilian System of Soil Classification (Cooper et al., 2005) associated with the topographic relief. Data set contains spatially referenced soil nutrient and carbon data for 0-20 cm and 40-60 cm depths for Juruena watersheds study area. Blank lines added to improve readability. The data set covers the period 2004/05/01 to 2004/08/18. Data set contains results from field study of spatial variability of soil properties. Soil samples collected using dutch auger and analyzed using EMBRAPA standard methods (Brazilian Agricultural Research Corporation) for analysis of soil chemical and physical properties (Silva et al., 1998). The units of cmolc (centimoles of charge) and dm3 (cubic decimeters) are common in Brazilian soil analyses employing EMBRAPA standards. Soil texture was determined using the pipette method with 16 hours of slow shaking (30 rpm) and dispersion of organic matter with NaOH and sodium hexametaphosphate. Soil color was determined on fresh, moist soils in the field using a Munsell color chart. Exchangeable calcium, magnesium and aluminum were all determined on dry soils extracted with 1 M KCl. Aluminum concentrations were measured via titration with NaOH. Calcium and magnesium concentrations were determined by titration with EDTA (provides a value for the concentration of Ca + Mg). Concentration of exchangeable Ca alone was determined by titrating the 1M KCl extract with 0.0125M EDTA after addition of calcon carbonic acid. Exchangeable Mg concentrations are then determined as the difference between Ca + Mg and Ca concentrations. Available phosphorus, exchangeable potassium and sodium were all extracted from air dry soils using a Melich I extraction solution (0.05 M HCl + 0.0125 M H2SO4). The ratio of soil to extraction solution was 1:10 w/v. Phosphorus in the extractant solution was measured on a spectrophotometer using the ascorbic acid- molybdate blue reaction. Potassium and sodium were measured by flame photometry (atomic absorbtion). Potential acidity, the sum of aluminum and hydrogen ion concentrations extracted with 0.5M calcium acetate solution was measured by titration with 0.025M NaOH phenolphthalein as an indicator. The analysis of carbon was done using the combustion method at high temperatures (Eltra oven at 1350 degrees C) and an elemental analyzer (Multi NC 3000) in which all forms of carbon in the soil are converted to CO2 followed by measurement of the CO2 (total carbon), following the method described by the Soil Survey Staff (1996). Cooper M, Mendes LMS, Silva WLC, Sparovek G. 2005. A national soil profile database for Brazil available to international scientists. Soil Science Society of America Journal 69: 649-652. The database is available for free download at http://www.esalq.usp.br/gerd/ (verified 04 Feb 2008). Novaes Filho J.P., Couto E.G., de Oliveira V.A., Johnson M.S., Lehmann J., Riha J. (2007a). Spatial variability of soil physical attributes used in soil classification of microbasins in southern Amazonia. Revista Brasileira de Ciencia do Solo (Brazilian Journal of Soil Science), 31, 91-100.doi:10.1590/S0100-06832007000100010. Novaes filho J.P., Selva E.C., Couto, E.G., Lehmann, J., Johnson, M.S., Riha S.J. (2007b) Spatial distribution of soil carbon under primary forest cover in Southern amazonia. Revista Arvore (Tree Journal), 31, 83-92. Soil Survey Staff. 1996. Soil survey laboratory methods manual. Soil Survey Investigations, Report 42 (Version 3.0). U.S. Department of Agriculture, Natural Resources Conservation Service, National Soil Survey Center, Lincoln, NE. 693 p.